Cheap Lecture is a translation of John Cage's Lecture On Nothing, presented as a rhythmic spoken performance set to music. 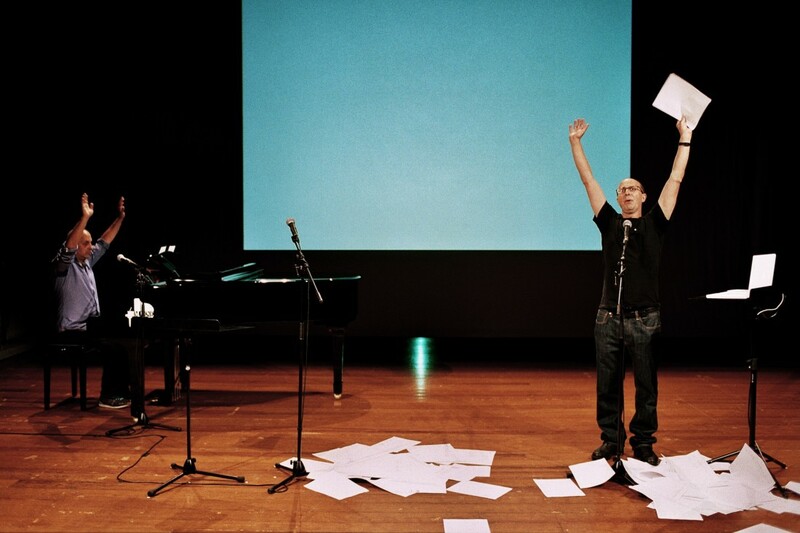 In a rant about empty hands, audience, time, repetition and dancing, Jonathan Burrows and Matteo Fargion reflect upon and continue the journey begun in their earlier trilogy of work, Both Sitting Duet (2002), The Quiet Dance (2005) and Speaking Dance (2006). The Cow Piece repeats the same structure. Using objects, text, movement and sound, it is a chaotic meditation upon dance, music and mortality. With philosophy and wit, the two artists reflect on their work, drawing us outwards into a series of unforeseen images and digressions. Cheap Lecture and The Cow Piece have so far been invited to 28 countries around the world, and Cheap Lecture was selected for the 2009 'best of the year' Het Theaterfestival in Brussels.